DH and I took a couple of days off and headed down to the Outer Banks for a short vacation with some friends. I managed to fit some knitting in between the rain and booze (and subsequent hangover). I finally finished my Trekking socks that I started back in June and took them on a short trek along Currituck Sound in Corolla, NC. Yes, the Trek Along With Me Knit -A-Long is over as of two weeks ago, and I am, once again, late! Pattern: er, not really. 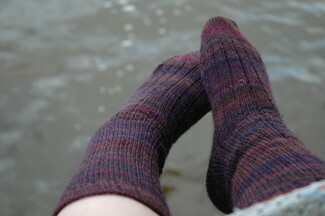 Toe-up, short row heel, 3×1 rib, increases on the calf since I made these much taller than my normal sock[!]. Start-Finish: 1 June – 15 September 2006. I am slow. I actually had some issues with these simple socks. I am still not very good at estimating when to start the heel on toe-up socks. I started these heels too early and it wasn’t until I had worked a bit up the ankle that I realized it and I had to rip both socks back to just before the heel. I also started the socks out on an Addi, doing magic loop with both socks at once. I grew tired of that once I reworked the heel, and worked the legs on their own. I don’t think it helped with my SSS problems much, but I did end up with a completed pair! I love these socks despite the non-matchy striping — luckily I expected that — and I would make another pair of socks in Trekking XXL, no problem! Very nice socks. I love the colors. They look like socks I would wear. That’s one great Trekking colour!!! Nice socks. Great socks! I never actually joined the Trek Along, but ended up making two pairs of socks with the yarn. I love the color you used, and I don’t mind socks that don’t match exactly. I think they are fun. trekking is such great yarn! i really must get some. i think that they don’t look that different! with the darker colors, i think that the stripe pattern is a little hidden. good choice. Socks look great! I am starting my first sock class in October. A little intimidated and excited. I have a feeling it is gonna take me awhile to get the hang of it. I love the outer banks – what a great place to finish them!